The Trust Center is where you can find security and privacy settings for Microsoft Office programs. With the consistent appearance of the ribbon in Office programs, steps to find the Trust Center are the same for each program. The options available in the Trust Center allow you to share documents with the people you want, as well as to find and remove hidden information you may not want to disclose. To learn more about Office privacy, read the Microsoft Privacy Statement. 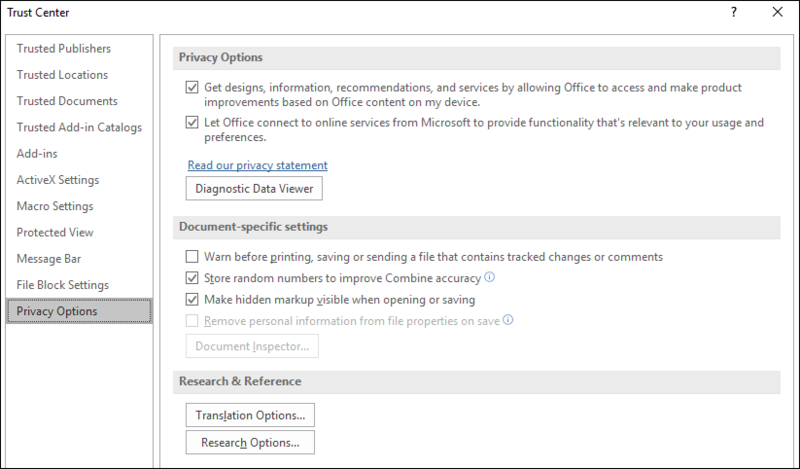 Important: If you're using Version 1904, or newer, of Microsoft Office then your privacy settings have moved. For information about how to access them see: Account Privacy Settings. In an Office program, on the File tab, click Options. Click the area that you want (on the left pane) and make the selections you need. For example, to change the privacy settings, click Privacy Options. When changing privacy settings, you should make selections that will help set the level of Office privacy you want. The selections can include getting notification if a document is from a suspicious website or links to one, or making hidden markup visible when files are opened and saved. Note: When you select Let Office connect to online services from Microsoft to provide functionality that's relevant to your usage and preferences, Office connects to online services and sites provided by Microsoft, such as Bing Maps, Insights, and Bing Weather. Important: Changing Trust Center settings can greatly reduce or increase the security of your computer, its data, data on your organization's network, and other computers on that network. We advise that you consult with your system administrator, or carefully consider the risks, before making changes to Trust Center settings. To participate in the work to improve Office products, follow these steps. Click the check box next to Get designs, information, recommendations, and services by allowing Office to access and make product improvements based on Office content on my device. If you are willing to participate, you don't have to do any additional work. You never have to complete a form, fill out a survey, or answer a telephone call. Microsoft automatically collects information from your computer, including the error messages that are generated by the software and when they are generated, the kind of computer equipment that you are using, whether your computer is having any difficulty running Microsoft software, and whether your hardware and software respond well and perform rapidly. In general, this information is collected once each day. This information is not used in advertising or sales in any way. Microsoft does not share this information with any other company. When you join the program, an identification number is generated randomly. That number is the only identification that is used when you share information with Microsoft. Because the number is completely random, Microsoft cannot trace your information back to you — and neither can anyone else.